The Bore of Venice: The North by North Westminster Diary: Carry On Junior Doctor? The North by North Westminster Diary: Carry On Junior Doctor? It’s all a little overwhelming. Today, Jeremy Hunt has released a revised version of the new contract for junior doctors, and it’s a classic piece of “the Tories giveth, and the Tories taketh away”. For instance, it contains an 11% pay rise, but it also has pay cuts for unsociable hours. The issue has been rolling on since the election, and with particular focus on the new definition of sociable hours as being from 7am to 10pm – the kind of working day which leaves time for you to dash home, have a quick drink and then take your anger and frustration out on those around you as you put another brick in the wall of your inevitable marital breakup. It also raises concerns about patient safety, with the possibility that they would be treated by “zombie doctors”. However, the definition of normal hours on a Saturday has been changed to from 7am to 7pm, and the Care Quality Commission has been asked to ensure that junior doctors will not be overworked. Regardless, the BMA isn’t having any of it and are refusing to go the negotiating table. This morning, Dr Johann Malawana from the BMA didn’t so much explain the logic behind this (they don’t think it’ll be an actual negotiation and want a guarantee that the contract will not just be imposed). He seemed to simply repeat “it’s megaphone diplomacy” several times. Which was banal. Some Junior Docs on twitter were much more direct. It’s just a bit murky. There seems to be politicking and manipulations going on everywhere, and I for one don’t know what to think. 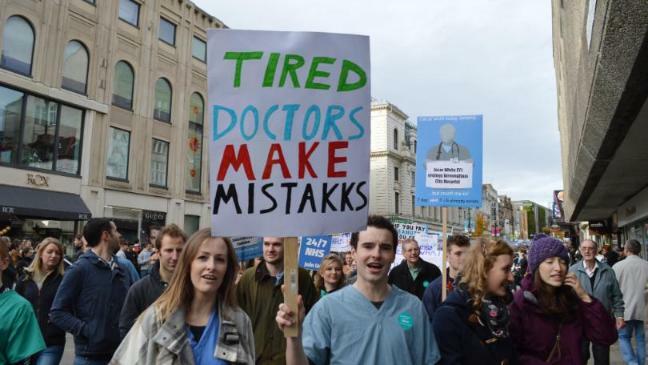 I mean, instinctively I want to trust the junior doctors because… well, they’re doctors. I like trusting doctors. As soon as I stop trusting doctors, I go on the internet and convince myself that I’ve got diphtheria*. And, instinctively, I don’t trust Jeremy Hunt because… well, he’s Jeremy Hunt. Besides, the whole thing is probably a distraction from the fact that Theresa May is now giving police and intelligence officers the power to look at your last year’s worth of browsing data. Which seems a little scary. I shall now go and watch old episodes of The Bill, so that if I am arrested they’ll be able to see how it’s done.